Make sure to head over to "The List" to see images and reviews of all the food we tried and also a video of our "Drink of the Day". In episode 59 Brad Fanshaw, Dave Marek and Heather Storm explore food and drink in downtown Los Angeles (DTLA). They begin with spicy bloody Mary's in the newly renovated Hotel Figueroa bar. Next, it is a side trip for a ride on the historic Angel's Flight railway to Bunker Hill. After they have explored the Grand Central Market our trio sits down for food and beer. Have a seat and learn some history, food options and our hashtag segments including; #TravelLikeAMan, #PartyLikeAMan, #DrinkLikeAMan and #BeEntertainedLikeAMan. Click Here to visit the GALLERY of photos from our day in Downtown Los Angeles. Don't forget to head over to The List for episode 59's links to all of our picks and for Heathers Drink of the Day recipe for the "Sazerac"
It's episode 58 and Spring is here, food festivals are popping up, we give you a great #travellikeaman tip for Spring travel. Our Drink of the Day is the "Pisco Sour" and we show you how to make it on our website. We help you #PartyLikeAMan with a hot bar suggestion and band suggestion. We also give you the #ShopLikeAMan lowdown with a col Amazon tip and finally we tell you all about Peru's Pisco Porton Super Premium Brandy in our #DrinkLikeAMan segment. Don't forget to head over to The List for episode 58's links to all of our picks and for Heathers Drink of the Day recipe for the "Pisco Sour"
It's episode 57 and Man Seeks Adventure is bigger, faster, stronger than ever before. Brad Fanshaw, Dave Marek and Heather Storm officially introduce you to our Roaring Reporter, Jeff Claire. Jeff comes out of the gate from backstage at the NBA AllStar Game in Los Angels. Next we give you our Drink of the Day from the Hawaiian Islands. This is episode 56 of the Man Seeks Adventure podcast and Brad Fanshaw, Dave Marek and Heather Storm are excited to have the podcast master on the show. Adam Carolla joins for a spirited talk about his passion for racing, comedy, his liquor brands and his shaping of the media world. Heather has created a drink of the day using the Carolla Drinks Mangria. Be sure to visit our website ManSeeksAdventure.com and go to "The List" for the a recipe. Episode #55 (Air Date 1-29-18) Golden Road Brewery Tasting and L.A. has gone to the Dogs! It is our first episode of 2018 and after a hectic holiday and January we need it as much as you! This episode was recorded live at the Golden Road Brewery in Los Angeles. Join Brad Fanshaw, Dave Marek and Heather Storm as they taste beer flights and give candid opinions of the flavors. They also tell you about recent travels and how L.A. and the airlines are going to the dogs! Just before the holidays Brad Fanshaw, Dave Marek, Heather Storm and guest co-host Matt D'Andria all went to the RadWood Car Show in Anaheim, CA. The group went to see this fun and lively show where cars are only from the 1980's and 1990's and many participants dress the part. After the show they find themselves recording this out of control podcast in a Hofbrau eating pretzels, drinking beer and tasting flavored Schnapps. Get ready to chuckle for just over an hour with Man Seeks Adventure. Brad Fanshaw and Dave Marek venture to Long Beach CA for research on a new TV concept Brad has in his head. This cool joint on a corner in the Bixby Knolls area of Long Beach was made entirely of shipping containers and offers a selection of eats and some great Fog City Brewery beer. Listen for a great description, review and Brad's epic rant regarding his not great stay at Encore by Wynn in Las Vegas. This week Brad Fanshaw and Dave Marek attend the NHRA World Finals of Drag Racing in Pomona, California. Heather Storm was off filming yet another commercial and was unable to attend. The guys had the opportunity to corner Don Schumacher of Schumacher Racing. They get a candid interview about his racing past and the present state of finding sponsorship for his growing roster of Top Fuel Funny Cars and Top Fuel Dragsters. Don is the King of Nitro burning top fuel competition and he really opens up in this interview with Man Seeks Adventure. Brad Fanshaw and Heather Storm are appearing live at the SEMA Show in Las Vegas on the MagnaFlow Stage. The two invite actor/comedian Tom Green to the show who is opening a new residency at the Bally's Hotel. Tom brings his comedic barbs and fun to the show and even indulges Dave Marek's "Top 5" on a call from Tokyo Japan. Next we invite our friends and multi-repeat guests, Elvis Monroe to the stage. Ben Carey and Bryan Hopkins don't let us down with great stories and incredible live music. Make sure to hop on over to "The List" to see our new Drink of the Day and for Dave's "This or That" with Tom Green. This is our 50th episode of Man Seeks Adventure and as we look back at our guests, travels, advice, food and of course drinks, we realized we have many more episodes ahead than behind. On this podcast Heather Storm gives us all the details of her great Midwest American Road Trip! Next Brad Fanshaw and Dave Marek tell us about their epic roadie to St. Louis to meet up with Michael Anthony, Sammy Hagar, ZZ Tops Billy F Gibbons and Collective Soul. Finally we wrap up the episode with a fall taste testing session of 6 different craft beers! This week the crew gets together for episode 49 and they have a lively discussion about Heather's upcoming road trip across America in her classic 1965 Mustang. Next they interview special guest Stevie DuPin aka The HillBilly Genius about his book the TransAm Diaries and his personal story about going from being a stand up comic to having cancer and coming out the other side. Finally Brad tells of a missed encounter and Heather provides her insight on how to tell if a woman is hitting on you or if it's just your male ego. We also have a new Drink of the Day - "HillBilly Iced Tea" - visit The List now for the recipe! 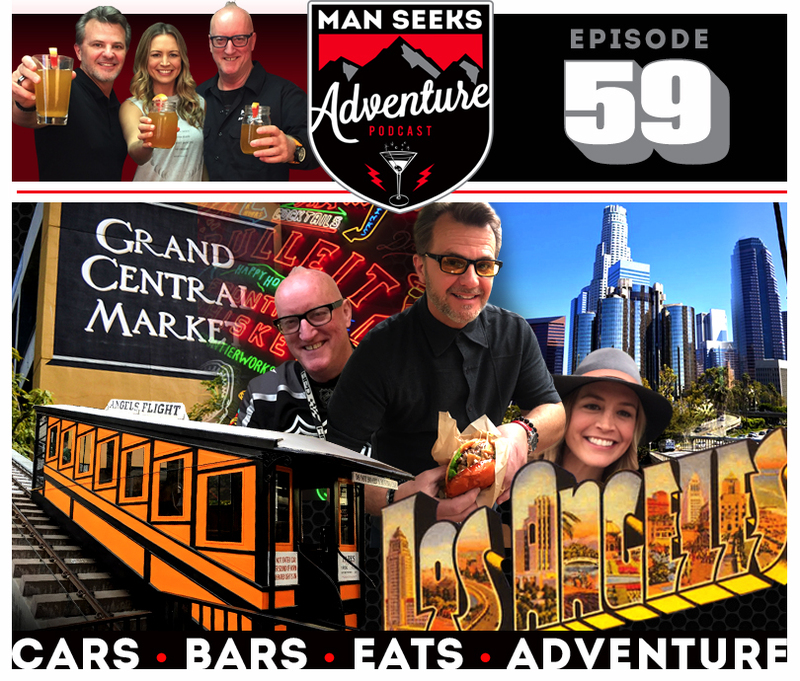 It's episode 48 of Man Seeks Adventure and Brad Fanshaw gets stuck in the studio while co-hosts Dave Marek and Heather Storm tour the San Fernando Valley in an impromptu Bar Tour Adventure. This week Heather tells you all about the new season of her TV show Garage Squad on Velocity, then Brad describes his Twitter chat with director James Gunn about a possible Starsky & Hutch TV reboot. Remember to head over to the LIST for this weeks special Drink of the Day. In this episode co-host Heather Storm is out of the studio so Brad and Dave are bacheloring it up! First Brad regales us with a travel horror story involving "Keith" the @#$hole from Advantage Rent A Car! It's pretty amazing... Next the boys dive head first into their bachelor for the weekend status and they do a Drink of the Day taste test with three different store bought boozes. That quickly derails the conversation and the boys start talking cars, reviving classic TV shows and then they end up doing a drunken blind taste test with three different crazy chip flavors! In this episode Brand Fanshaw and Dave Marek jump on the tour bus of one of our favorite bands, Elvis Monroe. First, Brad talks them into an impromptu Happy Birthday for Dave and then we get a real behind the scenes with the guys. This is a band you may not have heard of yet, but we are sure once you hear them, you will want more! 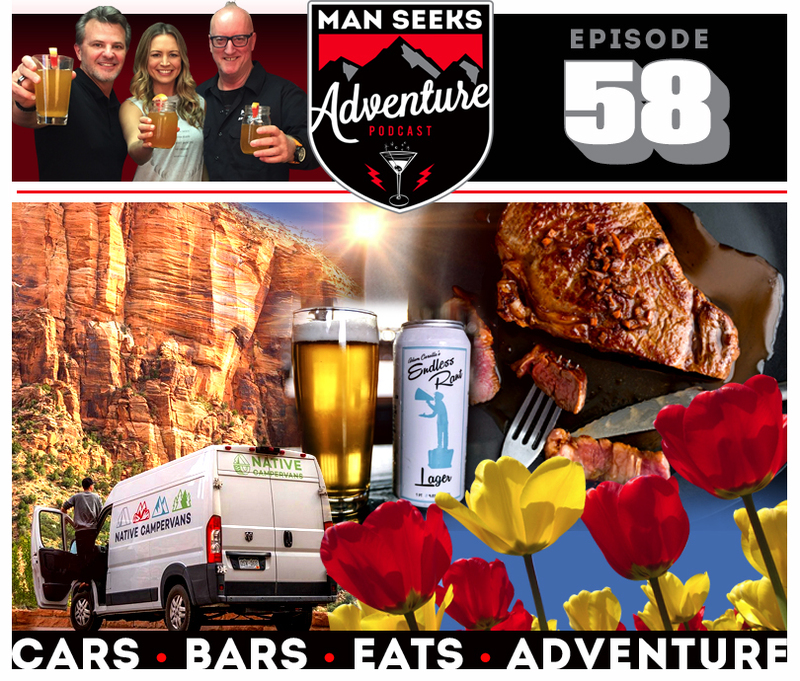 On episode 45 of Man Seeks Adventure Brad Fanshaw, Dave Marek and Heather Storm welcome Warwick Stone the creative force behind the Hard Rock Cafe chain, Hard Rock Hotel Las Vegas and Pink Taco. Surely just some of his achievements he has designed, acquired, valued and collected. Listen to the back stage stories of the Hard Rock and what he is doing today in Nashville. Make sure to pop on over to "The List" to see our newest Drink of the Day - the Brighton High Hat and to see Dave's "This or That". It's episode 44 of Man Seeks Adventure and Brad Fanshaw, Dave Marek and Heather Storm attend the RM/Sotheby's Auctions America collector car sale at the Barker Hanger in Santa Monica, CA. Brad grabs his friend Barry Weiss the star of Storage Wars TV show, collector and traveler. Later in the show Matt D'Andria the co-host of Shift and Steer, another podcast from bonspeedMedia joins Heather and Brad for a chat. Everything is manic and fueled by the Drink of the Day, a strong Manhattan named "Liquid Courage". Episode #43 (Air Date 6-06-17) Memorial Day, Fathers Day, Giant Bunnies and Hangover Cures! In this episode recorded over Memorial Day Weekend, hosts Brad Fanshaw and Dave Marek welcome Co-Host and resident Mixologist Heather Storm back to the studio! The show starts off with GIANT BUNNY talk! Then they discuss Brads brutal hangover and some great cures! Heather gives everyone some quick bar recommendations for your next trip to Chicago. With Father's Day approaching the crew all chimes in with memories of their Dads and everyone pitches in with some Father's Day Gift Ideas. Finally we wrap up with our Drink of the Day. Brad Fanshaw and Dave Marek went to the club Dirty Laundry in Hollywood, California to speak with Yousef Abu-Taleb about filming his comedy special, "Washed Up You Tube Star". This bartender/comedian takes a self-deprecating look at searching for stardom, being an American with Middle Eastern name(s) and a washed up You Tube celebrity. Listen to the Bonus Short live before the show begins. Episode #41 (Air Date 5-12-17) Travels, TV, Chicago, Shanghai, and Mom! On episode 41 Brad Fanshaw and Dave Marek are in studio, but Heather is in Chicago filming her TV Show, Garage Squad. Heather calls in and talks about Chicago, Dave discusses his travels to China and all of them talk about Mom just in time for Mothers Day. Learn about the special Drink of the Day named the "Berry Momhito". Head on over to THE LIST to see Dave mixing up our newest Drink of the Day - The Momhito.